Marion left school at c.16 (1951) and started in Kayser Bondor – until 1958. She feels they were pushed form pillar to post and so she left. Didn’t have a permanent job there so difficult to earn well. Singing and waving to their favourite songs. Moved to AB Metals – making TV tuners. Made redundant after 2-3 years – TV unit closed. In Kayser Bondor not earning much – crying coming home. Loved working In AB Metals. Gave her mother all her wages until she died (1960). Next to BSA making parts for guns. – closed down after a year. Then to Teddington’s making parts for aeroplanes. Cleaning coils under a microscope. Then to Hoover’s 1963. £10 a week and a weekly, monthly and Xmas bonus. Then equality became an issue. Member of union and shop steward. Working on new disposal bags. Once Equal Pay Act ,1970 passed – men became bitter. They knew Ford’s women (Dagenham) had had equal pay. Women contacted Ann Clwyd for advice. They went to management but convenor said they weren’t doing the same work as men. Men went on strike but had to give in, but animosity for years. Not fighting firm but the union. Describes changes in machines. C. 7000 employees in three MT factories. Hoover’s recognised 5,10,15,20 and 25 years service- necklaces. Good staff discounts. Years of wear and tear on body. Noisy and compensation. Section dos, but things changed as other companies took over. Left in 1992 after 29 years. 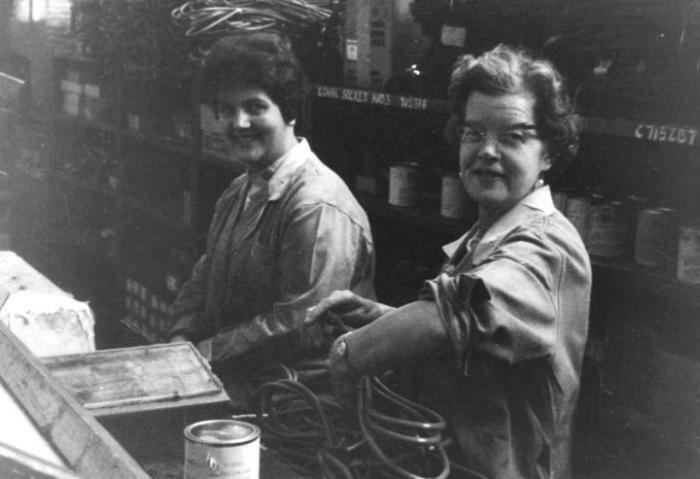 Kathleen left school at 15 (1955) and started in the office in the polish factory for nine months. It was dark and gloomy so she moved to Kayser Bondor. She worked in the ticketograph office – wages paid according to tickets collected. She then went on a comptometer course and moved to the wages dept. She explains the comptometer. The factory paid for her course. The factory moved up to Dowlais afterwards. Free buses home. She became a supervisor (1960). Until she was 18 her mother took all her money (pocket money only) but then she was on board and lodging. Going to dances. She left for London (six months) returned to AB Metals, and then again to Kayser Bondor (in accounts) and then she had her baby. If you were fast and accurate you could earn well in KB. 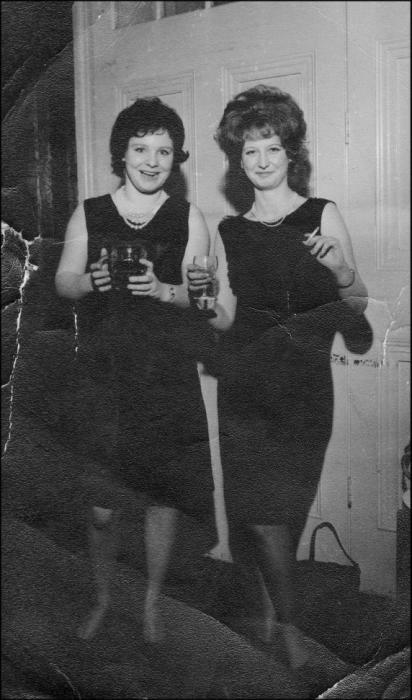 Story about her aunt and her blindness and buying a pub with the money she earned. The factory floor girls earned more money than the office girls. The men had more wages than the women. As supervisor she ordered the money for the wages – so many £1 notes etc. They worked the Kalamazoo system. Contention over overalls for the office staff. Working a year before entitled to holiday pay. She notes where she went on holiday – from Blackpool to Italy. Xmas dance in City Hall, Cardiff – by special train. She went to other KB factories to work e.g. Brighton – kind of work experience. She also worked in a knitwear factory in Leicester for 5 years and she’s also run a pub. Sylvia decribes her mother working as a cleaner and taking in evacuees. She took a chapel house – slave labour. Her father was a Communist. 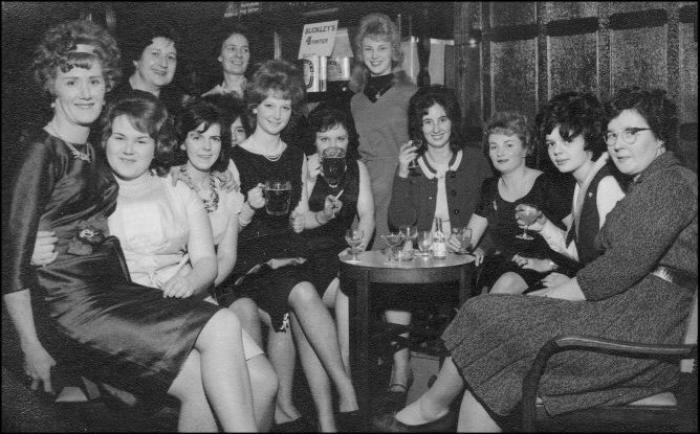 Sylvia went to Clarke’s Commercial College, left at 18 (1966), worked for electricity board, on to Copygraph factory Treforest, but hated it and ‘mitched’. Then she went to the biggest employer locally AB Metals – into invoicing section – worked like a dog. Stayed there 1959-1966. Made to feel an important cog in wheel. Twenty AB buses, but had to pay. She made one huge mistake with export documents. They made tuners for TVs and other electronic equipment. Details of job. Some girls had to sign the Official Secrets Act Complicated processes. Vast customer base. 4000 women workers – redundancies. Helped a friend to get a job in the pit. Loyalty to people on your line or in your office. First day at work in overcrowded office and everyone smoking Woodbines. Wonderful place to work – gave her confidence and capability. Complained re. lack of. space but they took the ceiling down instead. No trade union for office staff but she organised secret membership. Men 75% higher wages than women. Union rep. Saving with National Savings. Story about giving fellow-workers dexadrine and amphetamines to help productivity. Later withdrawal symptoms! Segregated canteens – office / assembly. Big social scene: going clubbing; sketches. Unmarried mother taken under their wing. She didn’t mix with the factory floor girls. Factory freed women up. Miss AB. Fabulous Xmas do in Cardiff. Left first time when husband to Huddersfield. Left second time because no pension – into local government. Mair left the grammar school because of her father’s ill-health, at 15½ and worked for W.H. Smiths before joining Kayser Bondor c.1952. Her mother was against her working in a factory. She describes the interview, the spotless factory – timing of toilet breaks; hand-cutting – shades and sizes of materials; producing bras and slips in huge orders; the importance of KB for Merthyr. 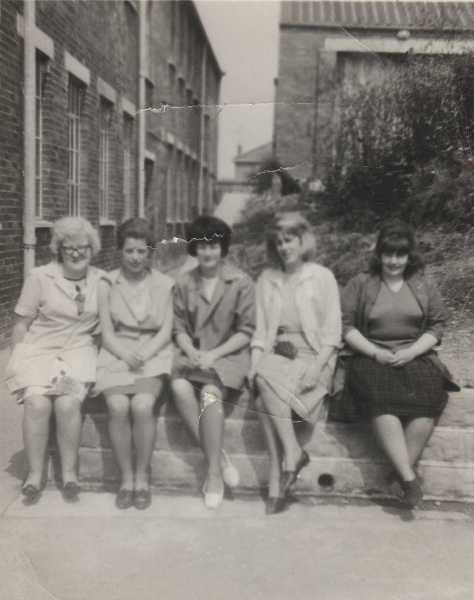 In Dowlais (1960 onwards) they made silk stockings and other garments. She remembers raising money in the factory after the Aberfan disaster. She notes the Xmas celebrations; the rate of pay, unions, one strike for pay and how Courtaulds treated them. Accidents with the cutting knives. She didn’t like working at A.B. Metals – it was dirty and the girls were different. She returned to KB and when it closed she moved to Barton’s and then to Forma – supervising the cutting room. She finished in 1995. Beryl began working as a housemaid in Malvern College after leaving school at 14+ c. 1950. She returned home and worked in a Home in Porthcawl but then moved to work at Steinberg’s, making camel-hair coats, but she didn’t like the machines or the rigid routine. She moved to Masteradio – working on the line, soldering and also on repairs. It was very cold there and you could have burns. She worked after marrying until made redundant c.1956. When the children were small she decided to try the twilight shift at Standard Telephones working on coloured wires. She left to try A.B. Metals – ‘easiest job and most money’. She was classed unfit for work in 1976. Greta worked in a milk factory before going to Ackroyds in 1982, where she stayed for 12 years, firstly checking the clothes for needle damage and later ironing them, for which she had to stand for 8 hours a day on a special foam mat. She enjoyed working there: “We had little breaks, five minutes every hour to go out and have a smoke and get a cup of tea or coffee from the vending machine. There was a good canteen there, they did toast in the morning, dinner time they did hot dinners. 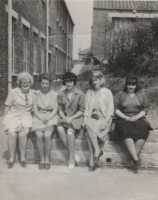 They had Christmas dinner and pudding there for every one, and decorated the canteen very smartly, there was a very nice atmosphere there Christmas time.” There was a good social life too, with trips out to places like Tywyn and to the races. She was made redundant in 1993, when the company decided to import pyjamas from China, but has gone back intermittently since then to help out in busy periods. Margaret left school at 15 (1964) and started in Addis, until her son was born in 1971. She made plastic pegs but had many accidents – cuts on her hands. She was moved to work in the mill – coating - dipping wood. They used Bostick to stick bristles – fumes made you high. Heavy work to lift trays. She also made eyelash brushes. Socialising at weekends. You put in an order if you wanted any factory goods. The factory also made Xmas trees. The paint place was outside the main buildings because of safety. Ten minutes only to have a smoke in the toilet. Paid through the bank. After this she went to Mettoys. She liked making garages – her first job, then she was moved to the conveyor belt. She worked with two hands putting wheels on toy cars. She stayed there c. 2 years. Had to keep going in Mettoys, The girls would send sweets down the line to one another. Or a note – SMILE! They learned to lip-read. At Xmas they could buy bags of toys – rejects. They had a pedal to push to note how many cars were done. If you were fast – earned a bonus. Men fetched and carried the components (windows / doors etc) to them. 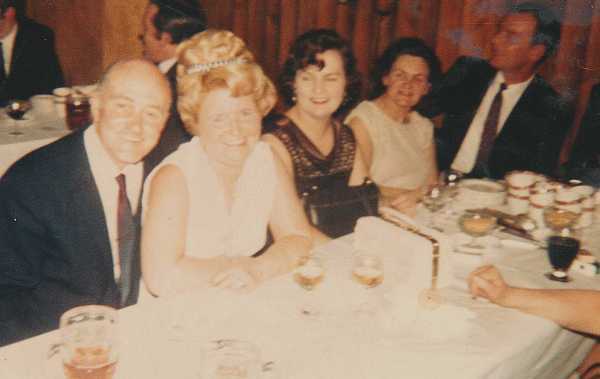 Yvonne left school at 16 (1962) and worked as a shorthand typist – bored. Eventually went to Addis (1963). The women she worked with became a substitute family – unhappy at home. Started as a packer on a line. Then moved to work on machines – then into training. Machines trimmed brushes and attached bristles. Very hot / or very cold. Dreaded visits of time and motion man. Joined TGWU union - disputes re. conditions not pay. Painful periods and having to stand all day. Talking to one another kept them sane. Smoking a massive issue – quick fag in toilets. Xmas time- went to club together. Left to work with a milliner, then into the army. Returned to Addis for c. 2 years – didn’t ‘come out’ in the factory because considered disgusting. When she moved in with her partner she went to work in Miles Laboratories (1972-74) – bottling medicine on the line. No time to talk. Excellent facities etc. 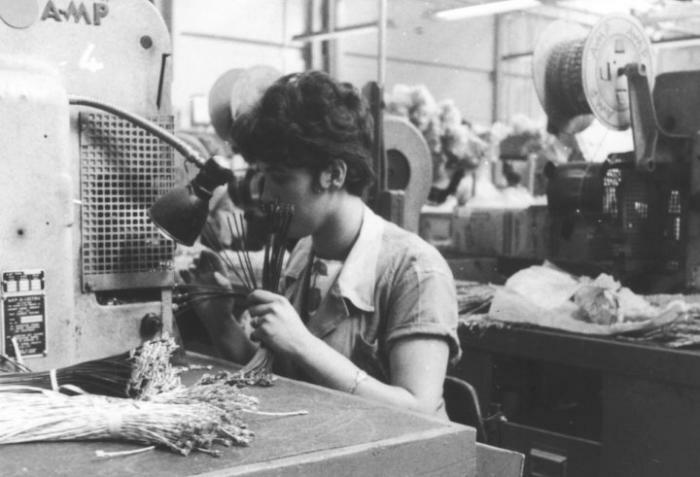 Factories gave women a sense of who they were as individuals. Learned to be loyal and discreet. Perks – buy seconds but also randomly frisked. Patricia left Swansea Technical School at 15 (1961) to work in the Addis factory, making hand brushes. She was on inspection. She stayed there 2 years. Then on to Windsmoor sewing factory, making army clothes (again 2 years). Then she had a son and went back to Addis – now producing mascara brushes. Next she went to Smith’s Crisps. The crisps would come down a funnel and she would put the salt in, in little blue bags. Stayed 6 months and moved to Corona –for 26 years (1966-92) . She started on the line watching bottles of pop going back and fore. 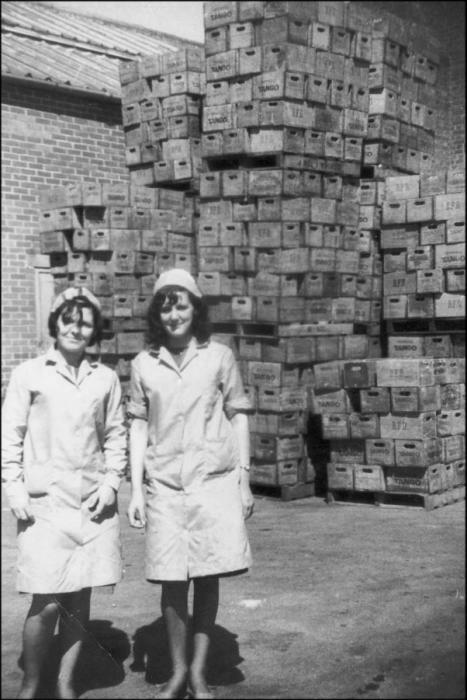 She also worked in the cellar room making pop and cider, then on the fork-lift, moving pallets. When the factory closed (1992) she went to Walkers crisps, again working on the fork-lift and night shift too. The factory floor was a bit manic. Buying seconds in the factories. Walkers - if there was no work – night off and no pay. Accidents – Acid burns in Corona and in hospital. Certificates for driving the forklift. Walkers’ and Corona cold – the pop froze. Hardly saw husband because of shifts. Corona was like a family – best factory. She worked in factories 1961-98. Later she worked in the university. Website design and hosting: Technoleg Taliesin Cyf.